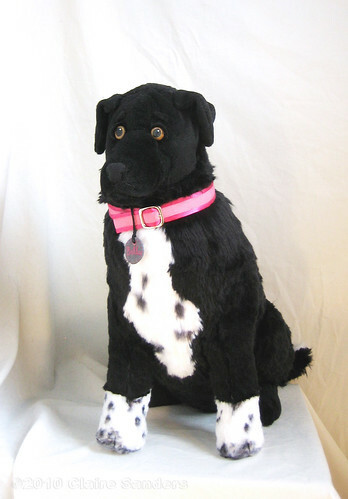 A fan of Alec's commissioned me to make a plush of his dog Bella as a gift for his wife. This is the result, I also put a couple more photos in flickr. This is my first time creating a likeness of a real animal. It was a bit of challenge trying to retain the essence of the real dog while still turning it into a cartoony stuffed animal. The finished version is pretty big: 18 inches high by 21 inches long nose to tail. "Did you guys get a new puppy?" -- a very common question our visitors ask. In fact, I would wager a few bones that 100% of the people that have walked through our front door have asked this very question! ...we are STILL getting great complements, Claire. Truly a job well done! that is so rad Claire! I've been wanting to make a stuffed Clam but every time I think about the different lengths of hair and coloration changes...man...it's not easy to replicate a real animal in plush!